Made of crystal clear, shatter-resistant polycarbonate, this half size food pan lid with handle can withstand temperatures from -40 to 210 degrees Fahrenheit! The durable polycarbonate material also resists food acids and oils to maintain its attractive appearance. Great product to lid my sides at the restaurant. We use in our cold table and it does exactly what we need it to do. These food pan lids are perfect. The handle is not really super necessary but it doesn’t hurt. If you know you use the containers to the fullest, then consider getting the lid without the indented handle. Fit perfectly on the containers. Easy to clean and have not stained from food product. Labels remove easily from lid if you are using tape to label food. Lid fits the 1/2 side pan perfectly. The transparent lids are great, no guessing what lies underneath. Super sturdy, never crack or chip. Highly recommended product! This lid works great. We use the container it fits to store shredded cheese. This lid is easy to remove and replace many times throughout the day. Typical 1/2 pan food lid. The handle is nice because it allows us to not have to rely on removing it from the sides and potentially touching the food product inside. I am sure that almost everyone here has used these lids in some capacity, so I am sure you know how great these are! No problems, and the shipping was very fast! these are great for keeping anything covered on a half sized hotel pan. It’s competely see through, easy grab middle part and a nice weighted thick plastic material. This lid is a must have to go along with the food pans. It is heavy duty and makes sure the food is protected during transportation and storage. Great sturdy lids. Easy to use, easy to clean, easy to hang. Fits well on top of the pans. Will continue to buy these when needed. I am satisfied with this product because this one has solid quality and clean looking. I can look through inside of container with this lid. I love these clear 1/2 size food pan lids. We use them with the clear matching container for dessert storage and they have really held up. Great deal! These 1/2 size clear polycarbonate food pan lids work great with our 1/2 size pans that hold spinach and fancy salad mix in our salad bars. The 1/2 Size Clear Polycarbonate Food Pan Lid with Handle is well made and durable. It has an easy to grip handle and the lid fits well on top of the pan. It is easy to clean and doesn't break if dropped. The price is great too! I will be purchasing more soon. Great Product . heavy duty plastic , we bought lot of these cause they are perfect to keep our products fresh and the price is unbeatable . Our staff love using the handle on the food pans. It makes it easy to lift, and the handle is attached so food doesn't get stuck under the cracks. I purchased this clear polycarbonate food pan lid to go on the stainless steel 6" deep food pan that I use in my catering kitchen. It is a nice heavy duty plastic with a little handle. Does as described. It can withstand a bit of heat as well. We will continue to order these as we need them, and would recommend to anyone. I got this to store deli meats and cheeses in so I could put them in the higher shelves of the fridge to be visible. Makes it easier for my teen son to see his snack options and eat something healthier than junk food. Glad I got two of them. Not too bad. I felt they were a little over priced for plastic lids that did not fit snugly on top of the containers they were supposedly designed for. This half size handled for food line pans are a perfect way to protect your food while its in between being served. The flat lids are stackable for space saving needs as well. Great lids for half hotel pans. They fit well, have a nice handle and seem to be sturdy. We will probably be buying more of these in the future! 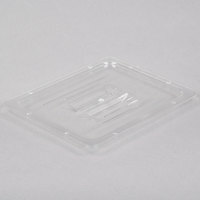 These lids are a cost effective solution for keeping food covered without plastic wrap. Use them everyday. Easy to clean and helps to maintain temperature. Tghe notched out lid keeps handles upright in your food containers helping you maintain safe clean environments. These come in a variety of sizes to fit wells, pans, and similar containers. The food pan try lid is great, we use this for home-made Tiramisssou, see also have the full size tray but prefer to use this size to keep it fresh. These lids are quality lids and average price. Shipping from Webstaurant on these lids was reasonable. We were concerned about the lids being fragile and chipping or breaking easily. That has NOT been the case. The lids are tough and stood up well to daily use so far. Overall a good product at a reasonable price. This 1/2 size clear food pan with handle lid is great. It's a little heat resistant so you can use this as cover for steam pans. The price is great. Great lids for the 1/2 size food pans, really durable, easy to stack for storage, easy to wash. Nice to be able to see what it's in the food pans being clear. We use all sizes of these food pans. They are handy for so many things.. we use them to heat gravies, and also to store a variety of items. Fit the food containers jut as I needed. Easy to grab to put on and take off, and keep my leafy greens in the container as fresh as I need them. These are a huge value compared to the other brands, we like these better as well, the lids stay on top of the pans much better than other brands too, simple to clean. These are great lids. The clear plastic helps the product be seen, even though the product in the container is concealed. Presentation of the product is much better since the lid is clear. It's always good to have an extra lid lying around and this one is great in the kitchen. I use this to aid with evaporation when cooking sous vide but also with storage around the house. Simple and cost effective. Durable product, easy to clean and wipe down. fits perfect on shelf and stackable. I ordered a variety of sizes and would recommend this product and will buy again. These lids fit great. They do not seal airtight but they're not expected to and the handle makes them easy to use. They're great quality and are very durable. We purchased these to use in our salad station. They work great to protect or romaine lettuce and keep it crisp and fresh. It helps prevent it from wilting. fits the bowls perfectly. clear makes it easy to see the food inside. small enough for condiments like pickles or chopped onions. getting more myself. Great 1/2 lid with handles We have dropped it on floor many time with out it breaking or cracking. Helps keep our food product in our prep station cool and at proper temp. It also makes for easy stacking in frig. This is the lid for the 1/2 size deep clear polycarbonate food pan. These are great to have for storing prepared foods in the cooler and the lid is a necessity because it allows us to stack them and save space. The pan lids are very simple products, not much to say except the price is great and they do what they are supposed to do. The 1/2 pan lids work great for keeping food covered while stored. The are a heavy duty plastic that does not crack when dropped or crushed in the dish pit. We couldn't be more pleased with these clear polycarbonate food pan lids. We use them on the food pans in our salad bar and they fit perfectly, clean very easily and the price is very good. nice clean food pan lid that fits perfect for 1/2 size pan. I can store my food very safe and clean in my freezer, I took a photo but it wont let me upload it. It works really good, easy to clean as well. Nice product! This fits my 1/2 pan and it's used everyday. Makes stacking easy and saves space when used on the 1/2 pan. Easy to clean and dishwasher safe. No staining noted despite what has been stored in it. These save us a lot of time and money versus the old way of putting plastic wrap over food on our cold line every night. It is not a tight fit on the 1/2 size food pan. I wasn't really sure what to expect. I guess it will be good if I want to stack something else on top of my food pan in the fridge. I bought these to go along with all of the half pans that I bought. Great product and very durable. Not scratch resistant so don't wash with stainless scrubber. Handle are well design no problem anytime using but the edges are very sharp feel like my skin got cut all the time. Clear lid are good to see food inside. This is a great, crystal clear lid for a 1/2 size pan. It has a built-in handle, smooth areas to apply labels or Day Dots, and makes it easy to quickly identify and evaluate the product inside. This is a perfectly fine plastic lid; it's not super thick and it does bend a little. Be aware that the hand goes inward so it reduces the volume by the slightest amount. This is a nice standard lid that just sits atop the 1/2 size containers. It does not snap on nor is it a tight fit, but when using them in the prep table for a simple cover, it's perfect. These are the same product we would purchase at our local restaurant supply house - but at a much better price. Same product, same use, lower cost! We bought this to replace plastic ware that could not withstand daily abuse and the temperature change, like freezer use. The lids fit perfectly on the food pans and its easy to clean. These lids are very handy! They are much better than wrapping items up each night, less wasteful and in the long run will probably save us money. We even use this for a lid on a metal 1/2 pan. Great quality plastic lid but I would recommend buying the ones with the spoon notch in them unless you are absolutely sure you will never need a slot in them for serving spoons. Good quality and resistant lid. The handles are not so useful as when filling the pan with food, if you go over a certain height, it becomes impossible to make the lid sit flush on the pan. We got these lids to help cover product on the make table on slow days and to cover prepped product. Over the long run a lid saves money over using plastic wrap. When budget is a issue these lids make for a great alternative to pricier lids. The only issue is how deep the handles go, in some instances it makes it difficult to store vegetables because the handles will crush the contents if they are stacked. The lids that go along with the pans are useful. They fit the pans perfectly, and they keep things nice and fresh. A good product.